Here’s my next entry for Lasang Pinoy – Street Food. This weekend, I drove up to Vegas for Ate Gigi’s house warming. 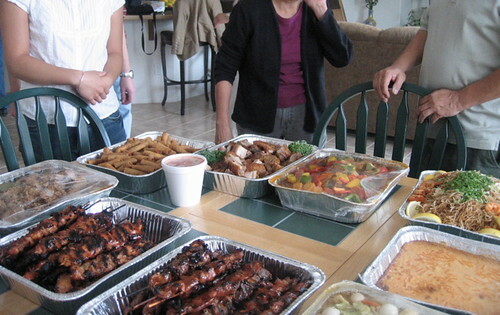 My dad ordered this yummy spread from his favorite Filipino restaurant. The priest from Christ the King dropped by about 15 minutes before our scheduled blessing. Apparently, he’s running late for another house blessing – so he did us first. He sprinkled holy water everywhere – on the dog, the TV, the couch, the food, the kitchen, everything. Father Jerry couldn’t join us for food – but he wanted to sample a little bit of everything. He wanted to try the lumpia. We put a take-away plate together with these addictive rolls, pansit, bbq and rice. 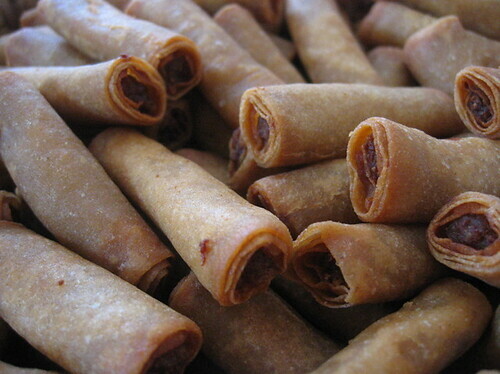 Lumpia is the easiest food to introduce people to Filipino cuisine. I remember having school and skating friends over for meals at my old house in Diamond Bar. These fried egg rolls were a hit with just about everybody. According to my dad, my mom has a decent recipe for lumpia. However, it’s for them easier to buy frozen lumpia from Green Hills and fry it up for company. I prefer the pork-filled lumpia over the vegetable offerings. The veggie lumpia has too much of a vinegar bite for my palate. 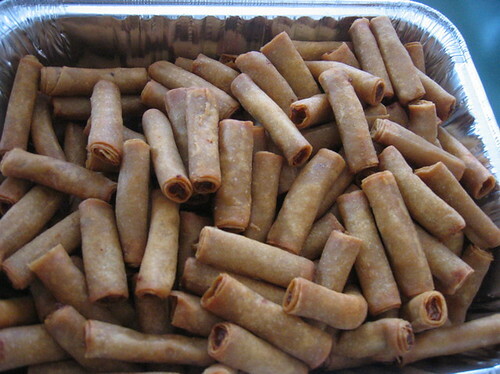 Lumpia is a street food for me because it’s so portable. Before my afternoon skating practices, my mom would warm-up some rolls and have me eat them during the car ride. During my college years, my dad would cook up a storm of Filipino food – enough for a couple weeks – before he headed back to LA. I’d fry up some lumpia before class. I’d munch on them on my way to the lecture. Sometimes, I even snacked on some during my professor’s talk….I had to cut it out because a crispy lumpia roll is a noisy one. I remember finding a Goldilocks stand at Six Flags Marine World. Goldilocks is a Filipino-American bakery/restuarant. But at Marine World – it labeled it’s offerings as “Asian” cusines. I got an order of lumpia and walked around the park with my favorite street food. We also had bbq-on-a-stick at the house blessing party in Vegas. 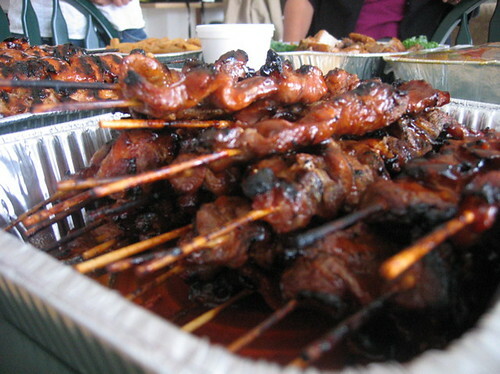 Bbq chicken on a stick is my runner-up for Pinoy street food. It’s smoky to the point of charred and oh so good! I love knawing on that stick and stripping off the tender chicken. 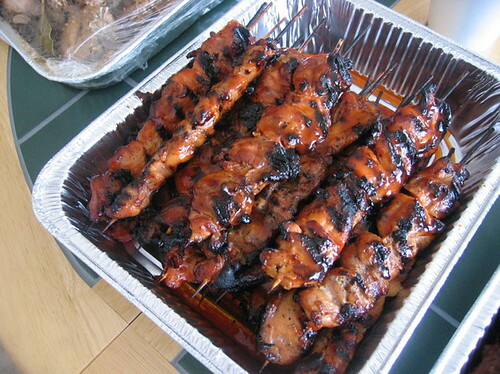 On my last visit to the Philippines, I remember bbq chicken on stick being a regular dish at family gatherings. Instead of being anchored to a table and plate, I could mingle with different pockets of family members and carry my meal on a stick. So…I have this blog entry dedicated to Filipino food in honor of Sen. Benigno Ninoy Aquino, Jr. Stefoodie.net came up with the idea and e-mailed me to join in on the blogging event. I’ll give it a shot…. My parents worked full-time. They needed to put together simple and straight-forward meals. They were both skilled at whipping together some pancit and whatever happened to be in the fridge – celery, carrots, pork, shrimp, whatever. I grew up in America. I was surprised that pancit would pretty much taste the same, on either side of the Pacific. Or maybe my family in the Philippines had access to the ingredients as we did in the States. OK – I can barely remember 1983. But I do remember when Ninoy’s wife, Corazon Aquino, ran against Marcos. She ran in 1986 and became the first female president of the country. Over dinners of pancit, fish and rice, my parents talked about People Power. I remember how excited they sounded about the protestors taking the streets, clad in yellow and chanting against the dictatorship of Marcos. In 1983 – sadness at Ninoy’s murder. In 1986 – hope. There was a girl in my elementary school who was one of Marcos’ granddaughters. On the playground, I remember asking her what she thought about the revolution that was going on the PI. “They’re not going to elect a housewife to run the country,” she informed me snidely. Well…the Filipino people proved her wrong. She didn’t talk to me after the elections. Not for a while, at least. 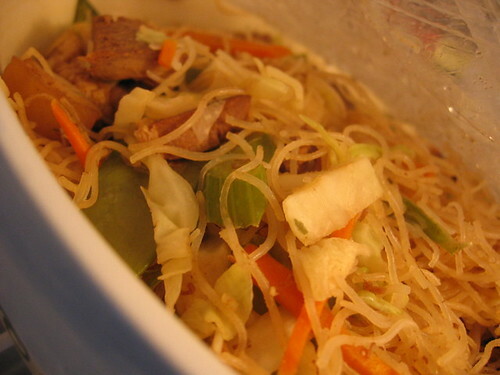 And this site has a decent recipe for pancit. This first time I tried making the noodles, I made the mistake of using water. Don’t do that. Just let the heat steam up the dry noodles – that’s going to be enough to loosen them up. Then fry the loose noodles with the veggies. Good stuff.